3 Bedroom Semi Detached House For Sale in Caterham for Asking Price £425,000. 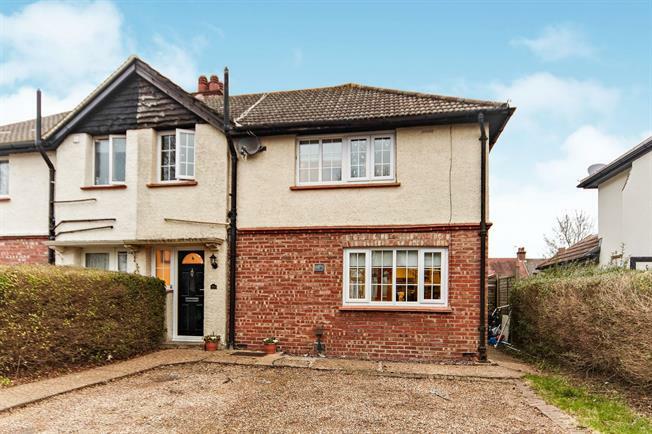 Set in a popular location, this family home benefits from a larger than average third bedroom as well as two further double rooms and a modern, refitted bathroom to the first floor. On the ground floor there is a modern refitted double aspect kitchen diner as well as a useful ground floor WC. The rear aspect lounge overlooks the gardens and benefits from an open fireplace. The outside space is a particular feature with parking for several vehicles to the front. Gated side access leads to the rear with a patio adjoining the rear of the house leading onto level lawns with panel fencing. The property in our opinion offers scope for further extension and a number of properties in the area have extend to the front and rear. With space for coats and unit, stairs to first floor and door to lounge. A rear aspect room overlooking the gardens with attractive open fireplace. Door to kitchen/diner. With doors to bedrooms, bathroom and access to loft. Window to the front. A rear aspect double bedroom overlooking the gardens. A good sized single bedroom. Refitted with a modern white suite comprising panel enclosed bath, low level WC and wash hand basin. To the front of the property there is driveway parking for several vehicles. Gated side access leads to the rear gardens with a patio area immediately adjoining the rear of the property leading onto a good sized level lawn with storage shed and panel fencing surrounding.